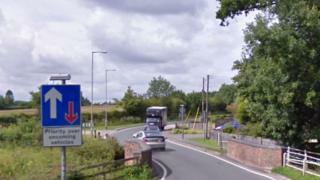 Funding earmarked for a travel route to connect two Berkshire boroughs will be used for road improvements instead after plans were scrapped. A Mass Rapid Transit between Reading and Wokingham was scrapped after councillors blocked the £20m proposals. Concerns were raised that the scheme would ruin a "lovely unspoilt area". It means cash has been released and plans have been put forward to build a £4m bridge in Barkham, Wokingham, in order to ease congestion. Councillors had said the plans looked "like a concrete jungle being dumped onto Wokingham Borough". As part of the new proposals, Berkshire Local Transport Body has allocated £4.3m towards building a new bridge alongside the existing crossover in Barkham by 2021. The two bridges would facilitate two-way traffic through the current bottleneck, according to the Local Democracy Reporting Service. Currently, the existing bridge is only wide enough to support single-lane traffic and operates via a give-way system. Elsewhere, cash will be spent for a park and ride in the town and to increase spaces at Winnersh Triangle Park and Ride.